This month’s focus has been on our “C” word CONCENTRATION. We’re taking a break this week, though, as today marks the beginning of Memorial Day weekend. So, we’re going to reprint an article by our Matt Fulks about someone who paid the ultimate sacrifice for our country, helping to give us the ability to enjoy our freedom and recreational outlets such as baseball. According to the website, BaseballInWartime.com, there have been only 12 major-league players killed during wartime while serving our country. Eight of those were during World War I, and the most recent was Bob Neighbors, who was killed on Aug. 8, 1952, during the Korean War. One man who could’ve been headed for the major leagues — at least according to his brother — was Herman Bauer, who was emerging quickly as a top catcher in the Chicago White Sox organization. After winning player of the year honors after his second season with the Grand Forks Chiefs, Bauer spent 1941 with the double-A St. Paul Saints. (At the time, double-A was one level below the majors.) Before that season, he helped his younger brother, Hank, get a professional tryout. After the ’41 season, Herman Bauer joined the Army. He was in the 3rd Armored “Spearhead” Division in a tank that landed at Omaha Beach in Normandy on June 24, 1944. 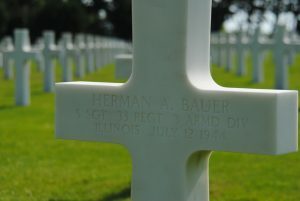 Less than a month later, on July 12, Bauer was killed at Saint-Lo. He’s buried at the Normandy American Cemetery. Herman’s younger brother, Hank, joined the Marines in January 1942, and volunteered for Jimmy Roosevelt’s 4th Raider Battalion, which was supposed to clear the beaches so more Marines and the Army could land. Once on an island, though, instead of leaving, the 4th Raider Battalion kept advancing. It’s easy to understand his trepidation. One of the times the Battalion couldn’t get off an island started on Easter Sunday, 1945, when the platoon made its fourth and final landing. This one was on Okinawa. On the 53rd day of fighting, Bauer took a bullet to his left thigh. (He also was wounded by shrapnel on Guam.) By the time the fighting on Okinawa was over, only six of the 64 members of the 4th Raider Battalion survived. “If it wasn’t for the Marines we still might be fighting,” said Bauer, who won 11 campaign ribbons, two Bronze Stars and two Purple Hearts for his service. Bauer resumed his baseball career when he returned and eventually spent 14 years in the major leagues, most notably with the great New York Yankee clubs of the 1950s. (In fact, Bauer still holds the record for most consecutive World Series games with a hit — 17.) The Yankees traded him in 1959 to the Kansas City A’s as part of the deal that sent Roger Maris to New York. Even though he pondered the question for, seemingly, a minute, there was no comparison between the two for Bauer. He played baseball but he was a Marine. Had Herman not been killed in World War II, he might’ve said something similar. Heroes. Men such as my dad’s brother, Warren, who died on a B-24 Liberator during World War II. As the story goes, the plane crashed into barrels of gasoline trying to take off in a dense fog. See, baseball players or not, these are the type of people we remember and honor on Memorial Day. Men and women who have had the courage to do what most of us — at least speaking for present company — don’t have the courage to do. And, who, ultimately, paid the greatest sacrifice. As easy as it is to place athletes on a pedestal, it takes courage to be a real hero. And it takes a real hero to serve our country.